I remember the day I discovered people had weekend cars. My childhood friend Greg Dorris casually let it slip that his dad had a weekend car stashed north of the city in New Paltz, New York. It was hard enough parking one car in New York City. Why bother with two? A few weeks later we piled into their family Honda Odyssey to unfurl the weekend car. I was skeptical until I saw the British Racing Green Triumph TR6, replete with proud Union Jack flags on its hindquarters, sitting in a nondescript barn. Back in the day (you know, the '90s), family-oriented enthusiasts didn't have choices when it came to a car adept at hauling around the family, dealing with winter's fury, and blasting along a country back road once the snow cleared. Sport-utility vehicles have evolved dramatically from bulky, clunky body-on-frame beasts to serene car-based commuters with hints of luxury. But the sport side of the equation-the creation of a tall, go-anywhere, four-door sports wagon-has been notably absent. There must be some compromises: It has to be big enough for five folks and their luggage. And it's going to have all-wheel drive because, according to the Department of Transportation, 70 percent of the country's population lives where at least 5 inches of snow fall per year. We Americans like to be prepared. Thankfully, Jaguar, Mercedes, and Porsche now have three new SUVs that fit this steep bill, all for the price of a loaded Chevy Suburban-so long as you're willing to sacrifice that rarely used third row. The Porsche Macan GTS is designed to bridge the performance gap between the lower-spec Macan S and higher Macan Turbo. The Macan GTS starts off with the S' 3.0-liter twin-turbo V-6, which gets revised ECU tuning to give it a healthy 360 hp and 369 lb-ft of torque. The V-6 is paired with Porsche's PDK seven-speed twin-clutch automatic with power being sent to an all-wheel-drive system equipped with optional brake-based torque vectoring. The GTS also gets the Turbo's electronic dampers mated to a standard air suspension with a lowered ride height. All this starts at $68,250, or $89,070(!) as tested for our heavily loaded example. Jaguar’s new F-Pace S, meanwhile, is the brand’s first SUV. Built on the same platform as the XF sedan, the F-Pace is the most powerful SUV here; its 3.0-liter supercharged V-6 churns out 380 hp and 332 lb-ft of torque. The V-6 sends power through an eight-speed automatic to a rear-biased all-wheel-drive system with electronic torque vectoring. The big Jag starts at $58,695, with our loaded example driving off the lot for $72,018. 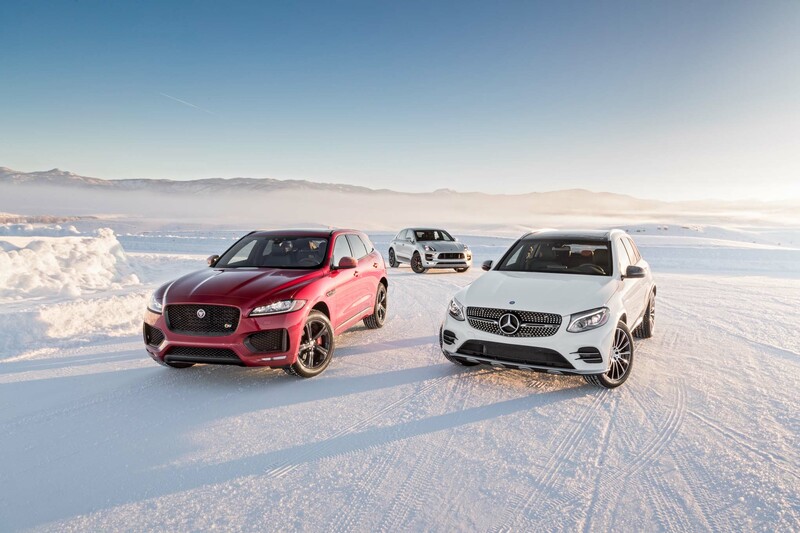 The Mercedes-AMG GLC43 swaps out the GLC300’s four-cylinder engine in favor of a 3.0-liter twin-turbo V-6 making 362 hp and the most torque of the trio at 384 lb-ft. Its AMG-tuned V-6 gets paired with a nine-speed automatic, and the AMG air suspension gives the GLC43 a sportier ride versus non-AMG GLCs. Our lightly optioned GLC43 is the value play of the group; it tested at $63,505 but starts at $55,825. Picking the best sporty all-weather family sportster from this trio wouldn’t be easy in sunny Los Angeles. Instead, we decided to order a set of winter tires for each, loaded the tires into the cargo hatches of our trio to simulate a full complement of passengers, and pointed our noses northeast toward snowy Steamboat Springs, Colorado, 1,000 miles away.